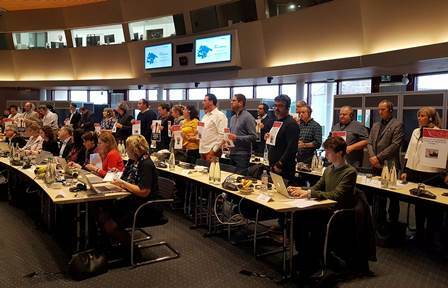 Over 30 Nestlé workers from across Europe attending the Nestlé European Works Council in Lausanne, Switzerland on 27 November 2018 expressed solidarity with workers in France facing closure of a Purina site in Quimperlé and a Froneri site in Beauvais. Delegates expressed their anger at Nestlé's continuous cost-cutting and restructuring programme, which will eliminate some further 200 jobs at Purina in France in the near future. Earlier this year around 200 workers from Nestlé's Galderma research centre protested at the Nestlé headquarters in Vevey against the closure of the research centre near Nice, France. The union delegates expressed their opposition to Nestlé's relentless drive to increase profits at the expense of workers and resolved to strengthen the fight back. Union delegates stand in protest at the opening of the meeting.